The past year was a rocky period for U.S.-Canadian relations, with differences over Iraq and trade disputes dividing these North American neighbors. But there is no evidence that Americans and Canadians are destined to go their separate ways. Canadian discontent with U.S. international policies mirrors opinion in many parts of the world. And, compared with European attitudes, Canadians voice relatively moderate criticisms of America. In fact, Canadian attitudes on a range of topics often bridge the differences between U.S. views and those held in Europe. Moreover, on some social and religious values, it may be more geography than nationality that divides Canadians and Americans. Where the two peoples do differ, the strongest disagreements often exist between Canadians and those Americans who live in the southern U.S. People who live in the northern tier of American states share many points of view with Canadians. North Americans--both Canadians and citizens of the United States-- are the most satisfied people in the world, notably more satisfied than other wealthy publics—particularly Western Europeans. Two-thirds of Canadians give their own lives high ratings and slightly fewer U.S. residents (64%), say they are quite happy with their personal lives. 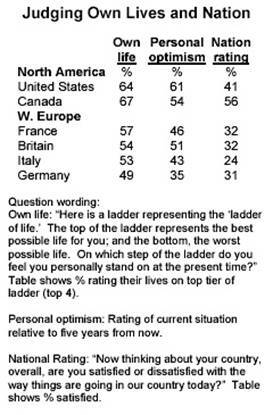 Looking forward, North Americans also are quite optimistic about the future, decidedly more so than most Western Europeans. Three-in-five Americans (61%) and more than half Canadians (54%) think their lives will improve. Among Western Europeans, only the British (51%) come close to sharing such optimism. When asked about various aspects of their lives, Americans and Canadians are most satisfied with their family lives, less satisfied with their jobs, and least satisfied with their incomes. And, despite high per-capita incomes, Canadians and Americans more often complain about economic problems than do Western Europeans, who cite health concerns as their biggest personal problem. Canadians stand out as happier with the state of their nation than do either Americans or Europeans, ranking at the very top of the 44 nations surveyed by the Pew Global Attitudes Project in 2002. More than half of Canadians (56%) say they are satisfied compared with 41% of Americans satisfied with the U.S. and a third or less of Europeans who are happy with their nations. This is not to say that Canadians do not have concerns about their country: they do. When the survey was conducted, the economy was seen as the top national problem around the world, including in the U.S. and Canada. But in notable ways the North American neighbors differ markedly in their concerns about their respective nations. While only one-in-five Canadians (19%) worry about terrorism, fully half of U.S. respondents say terrorism is a very big national problem. Conversely, eight-in-ten Americans say moral decline is a national problem, but only six-in-ten (63%) Canadians agree. And by roughly the same margin, Americans are more worried about education. Americans also are more likely than Canadians to cite government corruption as a concern. For Canadians and Americans, concerns about religious and ethnic hatreds top their list of global worries. Such concerns differ from those in other parts of the world, where the spread of infectious diseases--such as AIDS--is judged the top global problem in more countries. But Americans are more worried than Canadians and Europeans about nuclear weapons. And Canadians are more troubled by global environmental problems than are either Americans or Europeans. Events of the last few years have taken their toll on U.S.-Canadian relations, but cross-border ties still remain stronger than U.S. ties with Europe. The image of the U.S. in Canada slipped modestly with the war in Iraq, from a 72% favorability rating before the war to 63% after the conflict, a 9 point drop. But compared with the reaction among some other American allies, this decline in support was relatively modest. U.S. favorability fell 20 points in France and 16 points in Germany over the same period. Similarly, five-in-ten Canadians (54%) still think they should maintain close security and diplomatic ties with the United States. Only two-in-ten (23%) of the French and four-in-ten (43%) of the Germans agree. Significantly, Canadian opinion of the American people--as opposed to views of the United States--did not decline with the war. In nine of 14 countries where Pew Global Attitudes trends exist for this question, public attitudes toward Americans worsened. But 77% of Canadians maintained a favorable attitude toward Americans, with 34% holding a very favorable view, the second highest total among those surveyed. On the other side of the border, the image of Canada fell in the U.S., even a little more than vice versa. More than eight-in-ten Americans (83%) held a favorable view of Canada in 2002. But that approval fell to 65% in 2003. Furthermore, Canadians, like Europeans and people all around the world, continue to like American pop culture and admire U.S. technology. But Canadians share with many people around the world a frustration with U.S. foreign policy. And there is a sharp difference between how Canadians and Europeans view America's role in the world and how Americans see those same global activities. Seven-in-ten Canadians (70%) think the U.S. acts unilaterally by not taking others into account when forming international policies--a concern also held by Germans, Italians and French and less so by the British. But Americans have a very different perspective. Only one-in-four (25%) think the U.S. acts unilaterally. Similarly, 68% of Canadians say U.S. actions increase the gap between rich and poor countries, a sentiment shared with the French (69%) and the Germans (70%). Only 39% of Americans agree. And 24% of Canadians, 37% of people in Britain and fully 51% of Italians say the U.S. does little or nothing to help solve world problems. Only 17% of Americans agree. Finally, the spread of American influence troubles Canadians, half of whom say it is a bad thing that American ideas and customs are spreading there. Europeans are even more adamant: 72% of French, 70% of Germans and 56% of Britons regard the spread of America negatively. Canadians and Americans share a number of similar values. Nearly two-thirds of Americans (65%) and Canadians (63%) think people determine their own success in life. This sense of personal empowerment is not shared by Europeans, where pluralities agree that people have little control over their own destinies. And Canadians (77%) and Americas (73%) both believe that the government should take care of the poor. Both are much less committed to a social safety net than are Western Europeans (91%). The North American neighbors part ways over individualism. Nearly three-in-five Americans (58%) believe that freedom to pursue their life’s goals is more important than guaranteeing that no one is in need. Only 43% of Canadians and even fewer Europeans agree. And Canadians are much greener than Americans. Two-in-five Canadians (44%) believe the environment is a global threat, compared with only one-in-five (23%) Americans. Further, respondents in Canada say that protecting the environment should be given priority even if it results in a loss of jobs, something Americans favor much less. Canadians are also more internationalist than Americans. For instance, even before the U.N. debate on the Iraq resolution, 28% of Canadians saw the United Nations as "very good" for their country in 2002. Only 18% of Americans agreed. In addition, Canadians almost universally think global trade is a good thing for their country (86%), while Americans are slightly more skeptical, with 78% supporting trade. Moreover, Canadians and Western Europeans are more likely than Americans to say they like the availability of international products, the flow of popular culture across national borders, and faster international communication and greater trade. Finally, Canadian social and religious values are much closer to those held by Europeans than by Americans. Nearly three in five Americans (58%) say a person has to believe in God to be moral. Only 30% of Canadians and 23% of Western Europeans agree. Publics of Canada (69%) and Western Europe (77%) also are more accepting of homosexuality than Americans are (51%). As for the role of women, only 26% of Canadians and 19% of Europeans say the husband should be the sole provider for the family, while the wife takes care of the home and children; 37% of Americans take that traditional view. On many of these values issues, however, geography may have as much to do with public attitudes as nationality. On a range of issues, the views of Americans who live in the northern border states are much closer to values held by Canadians than are the values of Americans living in the U.S. south. For example, a strong majority of Canadians (68%) believe that people do not have to believe in God to be moral. Most Americans living along the Canadian border agree (62%). Only 38% of people living in the American south share that view. Similarly, Americans living in the northern tier of U.S. have views on homosexuality that are closer to the Canadians’ than to those of their fellow citizens of the south.